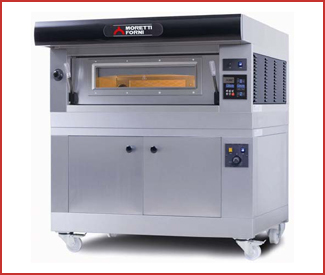 Moretti Forni have manufactured professional pizzeria equipment since 1946. They are the leading European manufacturer of pizza deck ovens. The Moretti Forni Amalfi is the flagship product from Moretti. When the best is not enough, there is Amalfi. Handmade by craftsmen with the best components each Amalfi is produced as a unique oven. 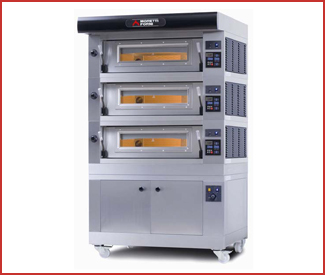 The baking deck is entirely built in refractory brick and the heating elements are inside the stone giving an uncomparable temperature maintenance and quality of baking. Every Amalfi oven features the exclusive Moretti System Control electronic board with split settings for heating the ceiling and bottom of the deck, a swich on timer, economy function, and cooking programs. Moretti Forni Amalfi ovens are fitted with heavy duty doors insulated with high density fibre to maintain oven temperature. There are four sizes available in single, double, or triple deck configurations. Each oven is supplied with a hood and base for added insulation, and your choice of stand or proover. Click here to view the Moretti Forni Amalfi brochure.